Coming off the back of four straight defeats, Liverpool's chances of landing the Premier League crown we’re looking ominous with patchy early season form. 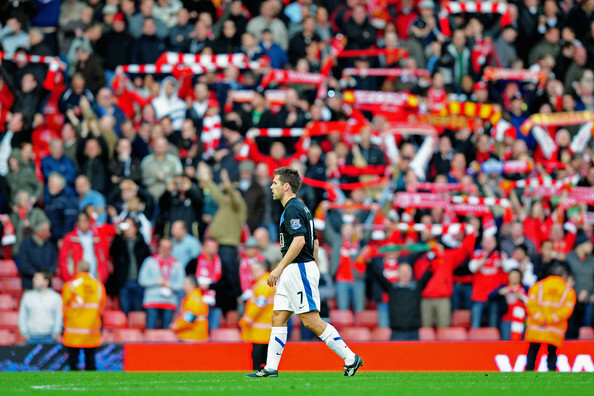 But the visit of Manchester United to Anfield brought the best out of an under-performing Liverpool side. A half-fit Fernando Torres was once again a thorn in United’s defence with a well-taken strike, brushing off Rio Ferdinand to blast the ball into the net. Substitute David Ngog notched a second late on as United pushed on for an equaliser. Meanwhile, the return of Michael Owen was greeted was a chorus of boos as the former Kop favourite was goaded with chants of ‘once a manc, never a red’. There were many low points to choose from for this particular category. It didn’t get much worse than the debacle at the DW stadium though. Without managing a single shot on target all night against a relegation battling Wigan Athletic side, Liverpool succumbed to one of their lamest defeats in years. Dirk Kuyt’s terribly mislaid pass led to Hugo Rodallega tapping in the only goal of the game in what was a horror show for the men in Red. It’s unfortunate to admit that four or five players could have easily fitted into this category. Even skipper Steven Gerrard has had a season to forget with only sporadic moments of inspiration in the whole of 2009/10. Dutchman Ryan Babel though has yet again failed to deliver performances that match his undoubted talent. It could be argued that Babel hasn’t started enough games to be in the running for this award (12 starts – 09/10), but whenever he has made the first XI his productivity hasn’t really warranted further appearances. Babel must be one the biggest enigmas across Europe because while once more he has presented glimpses of genuine brilliance, it’s the failure to deliver on a consistent basis that has blighted his career to date. After promising contributions in his opening season (2007/08), last season saw Lucas Leiva slip down the estimations of many supporters with some lacklustre displays. However, the Brazilian has come back stronger this season with the 23-year-old becoming accustomed to his new role as a defensive midfield player, shown by his presence as one of the top five tacklers in the Premier League (source: Opta). While many supporters are still yet to be convinced (and probably never will be), 2009/10 has been a good season for Lucas, including several outstanding performances, most notably against Manchester United(home) and Lyon(away). In truth this category came down to just two players with Alberto Aquilani and Glen Johnson troubled with injury problems for much of the campaign. While Maxi Rodriguez is also proving an excellent addition, Sotirios Kyrgiakos has surprised everyone with his solid defensive displays and whacky haircut that have led to a cult status for the Greek. Bought for around £2m from AEK Athens, Kyrgiakos has proved an invaluable asset to the Liverpool squad with injury problems to both Daniel Agger and Martin Skrtel. It’s an indication of the enigmatic Ryan Babel that he fits into two such diverse categories. With Liverpool in desperate search of a goal that would see them progress to the Champions League knockout round, substitute Ryan Babel collected a pass from Yossi Benayoun, stepped inside the defender and unleashed a blistering shot into the top corner from around 30 yards out. A stunning strike that unfortunately, just wasn’t enough to see Liverpool through as Lyon snatched an equaliser in the last minute. David Ngog’s development as a straight replacement for Fernando Torres has been reason for encouragement throughout 2009/10. After fleeting appearances in 2008/09, Ngog’s eight goals in all competitions this season have helped to cover the absence of Torres. The Frenchman’s strength, skill and movement have made the £1.5m price tag that Liverpool paid PSG look like a shrewd piece of business by Rafa Benitez. While there’s no doubt a more established centre-forward could be on the wish list for 2010/11, it’s important to not write off the impact David Ngog has had this season. It’s difficult to articulate just how good Pepe Reina has been this season. How he didn’t make the PFA team of the year is a mystery in my eyes, and while the Spanish number one jersey is also likely to evade the 27-year-old in South Africa, this season has confirmed Pepe as one of Europe’s best goal keepers. In Pepe Reina, Liverpool have a goal keeper that they can rely on for many years to come. Red and White blogger - Liverpool FC blog - Presented By Blogger Templates | Free Wordpress Templates. Mobile platform by Phone Tracking, Music Guitar Song Chords Originaly by Designer Carl Mason.